Woohoo! Easter is on its way! These are my 'Egghead buddies', who, like most of my creations, tend to remain nameless. Duckie on the left has a tail at the back, as does Bunny on the right. Just finished: an Easter egg small purse for little girls. Decorated with beads and eyelash yarn while I watched Corpse Bride (for the second time in two days). Warning, when this pattern is available, there are over 20 ends to weave in. Still on the hook: what will most likely be a large twin-size afghan, constructed with strips of squares. Not too manly, not too feminine (well, it could be depending on colours you choose to make it in! ), but again, lots of ends to weave in. You might get the idea I *like* weaving in all those tails. NOT. But, I take time throughout the afghan (I am not a weave-in-as-you-go person), to sigh, pick up a large-eyed sewing needle, and challenge myself to weave in the ends. When it's a challenge, it goes so much easier. 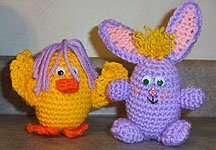 I must say, I was flattered to find so many people interested in my Easter Marshmallow chick and bunny. That in response to my posting my Easter page when someone was looking for a crocheted marshmallow peep pattern. I have to try some of these in thread, for a project I'm working on. Must say, I do prefer the real marshmallow version...in edible form. I've seen people use them as jewellery, and, well, I'll take mine without shellac.